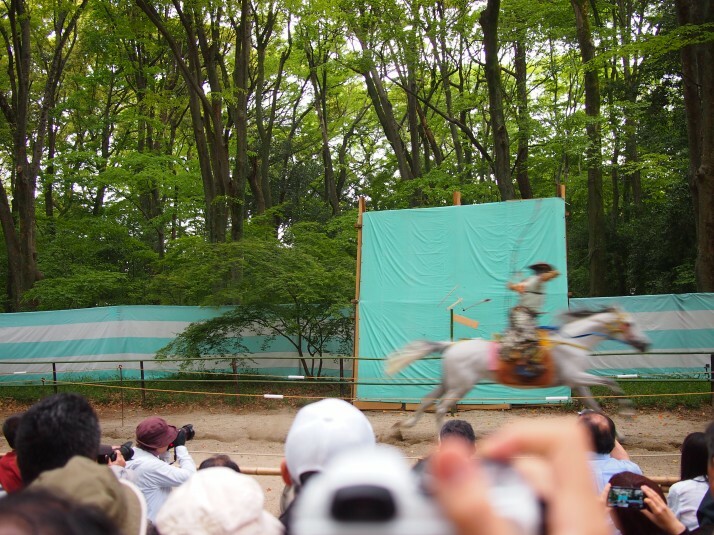 Once a year on the 3rd of May (which fell at the beginning of Golden Week this year), the Shimogamo Shrine in Kyoto hosts a display of Yabusame – or Japanese mounted archery. Originally started by Minamoto no Yoritomo in the Kamakura period (1185 – 1333) to improve the archery of his shoguns, this event is now part of the Aoi Matsuri (or “Hollyhock”) festival in Kyoto, and it was a happy coincidence that we were in Kyoto and able to see this fantastic display of skill. The 5 riders in traditional costume take it in turns to race down the 255-metre track 6 times, taking aim at 3 consecutive wooden targets on each pass. By the time we’d arrived the crowds had already gathered, so we took up a place by a large green square which turned out to be the background for the final target. 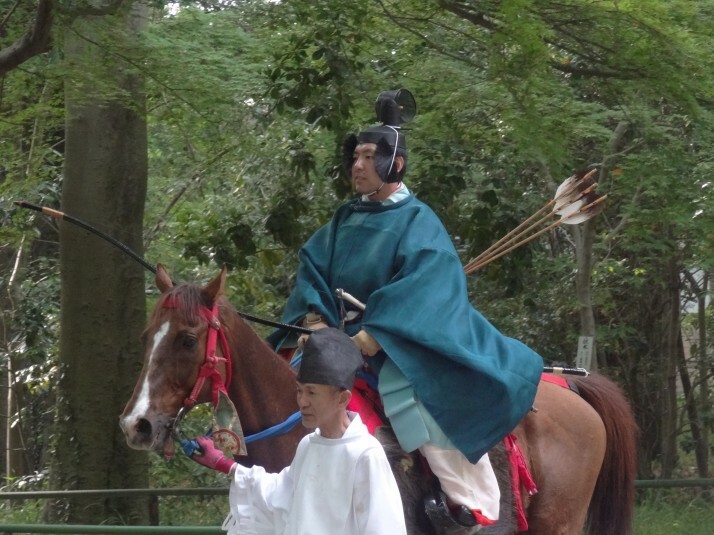 The Yabusame archers started the procession to the starting line at 2pm and very soon afterward we heard the crack of splintering wood and the roar of the crowd before the first rider came thundering down the course towards us, at the last possible second drawing his bow across his face to lose an arrow into the final target. We didn’t see the arrow at all, the archer flashed past and the target exploded behind him – it was so quick! The speed and control of the horses reminded us of the Mongol warriors during the reign of Chinggis Khaan, where archery, horse-riding and wrestling are huge sports celebrated every year at Nadaam festivals throughout Mongolia. Here’s a short video we took of some of the Yabusame archers which hopefully shows their skills of speed and accuracy..
A woman in the crowd next to us translated some of the announcements for us, and it turned out that one of the archers was an extra in the movie The Last Samurai! This entry was posted in Experiences and tagged Japan, Kyoto, Yabusame on June 8, 2014 by Andrew. What is 24 + 12 ?